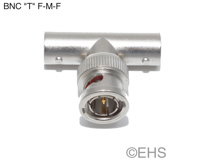 Top quality Amphenol BNC "T" adapter for 75 ohm applications. Female - Male - Female or Jack - Plug - Jack configuration. Rated for up to 4 GHz. Nickel shell and gold center pin.